Apple today launched new bands for the Apple Watch, and announced new case finishes for the Apple Watch Series 3, during its special event at the Steve Jobs Theater in Apple Park, Cupertino. 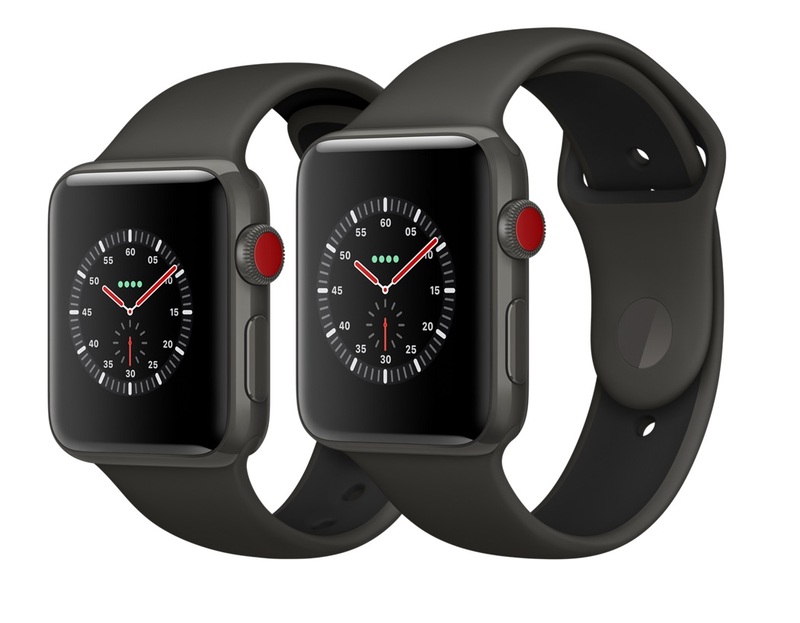 The new bands begin with the "Sport Loop," which Apple describes as a "soft, breathable, and lightweight" strap that's made of double-layer nylon and fastens with a hook-and-loop enclosure that should make fitting easier. It's made for users who want to wear their Apple Watch while working out, with soft cushioning that allows moisture to escape. Sport Loop is available in Flash, Spicy Orange, Electric Pink, Midnight Blue, Black, Seashell, Dark Olive, and Pink Sand. Similar to other sport-related bands, Sport Loops cost $49. There's also six new colorways in the classic Sport Band that users can choose from: Rose Red, Blue Cobalt, Ultra Violet, Dark Olive, Soft White, and Gray. There's just one new Nike Sport Band in Pure Platinum/Black. Similar to previous iterations of the Sport Band, the new colors are made with high-performance fluoroelastomer and are Apple's most water- and sweat-resistant Apple Watch band. Sport Bands still cost $49. Woven Nylon got one of the biggest updates today, with nine total new colorways: Dark Olive Check, Midnight Blue Check, White Check, Spicy Orange Check, Berry Check, Black Check, White Stripe, Midnight Blue Stripe, and Black Stripe. Woven Nylon bands cost $49. For anyone looking into buying a new leather Apple Watch band, there's quite a few new additions to the Classic Buckle and Leather Loop collections. Classic Buckle has Cosmic Blue, Pink Fuchsia, Dark Aubergine, and Ruby (PRODUCT)RED. Leather Loop has new Cosmic Blue and Charcoal Gray colorways. Classic Buckle and Leather Loop bands cost $149. 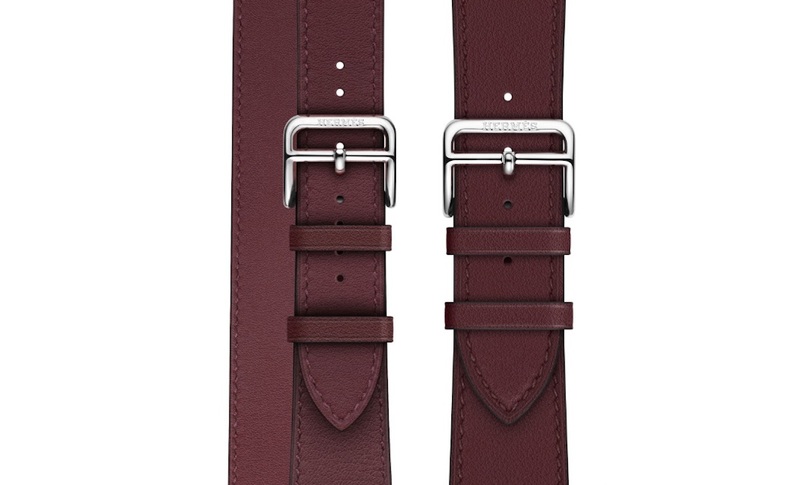 Hermès has two new Apple Watch bands, the Bordeaux Swift Leather Double Tour and the same colorway in a Single Tour. The accessories cost $489 and $339, respectively. In addition to all of the new and updated band colorways, Apple unveiled a few new case options today. There's the usual silver and space gray aluminum, but Apple Watch Series 3 now comes in a new gold aluminum. Silver or space black stainless steel cases remain an option as well. One of the more notable case additions is the new Apple Watch Gray Ceramic Case with Gray/Black Sport Band. This is the new "Edition" version of the Apple Watch, beginning at $1,299 and sold alongside last year's White Ceramic model. Elsewhere, Hermès has new Apple Watch collections with new bands that can't be purchased individually. These include the Single Tour Rallye in perforated Gala calfskin, inspired by the classic Hermès driving glove, and the Single Tour Eperon d'Or in printed Gala calfskin, inspired by the equestrian scarf pattern designed by Henri d'Origny in 1974. A new watch face, inspired by the Carrick Hermès watch, also designed by Henri d'Origny in 1993, completes the existing selection of Hermès watch faces. Apple Watch Series 3 with cellular connectivity will be available in 9 countries and 14 carriers from September 22, while pre-orders for the device will go up one week prior on September 15. Visit Apple's website to browse all of the collections that will be available for pre-order. I was in front of my Apple TV with an uninterrupted 100mbs connection, but at least 50% of the keynote was unwatchable due to delays, hangups, and video/audio that was not synced. Nice job Apple. That has to be your internet connection because I watched on my Apple TV and it was flawless. Yeah, I know watch bands aren’t exactly the highlight of this keynote, but those new wrap-around sport bands look cool. Congrats Apple, you get my money, again. It was flawless with me (200mbps, Spectrum NYC), complain to your internet provider and maybe you'll get credit or something. Found another image via Reddit. Only one set of strips. Looking forward to the new Hermes! great improvements all around from tech to bands...but curious about the red dot? just an identifier of the generation or? Had the same issue, connection kept dropping. Frustrating! I kept refreshing the page to fix it. The sport loop is what I've been waiting for! Already got my watch favorites for a quick buy. Can't wait!! Has anyone seen a video of how the sport loop works? Does it just fold over and stick to the strap. I always wanted a woven nylon band, but their one-size-fits-all didn't fit -- and I do NOT have large wrists.